Tierra Garden 4432 Rectangular Red Cedar Raised Garden Bed by Tierra Garden at Tulips Orchids. MPN: 4432. Hurry! Limited time offer. Offer valid only while supplies last. 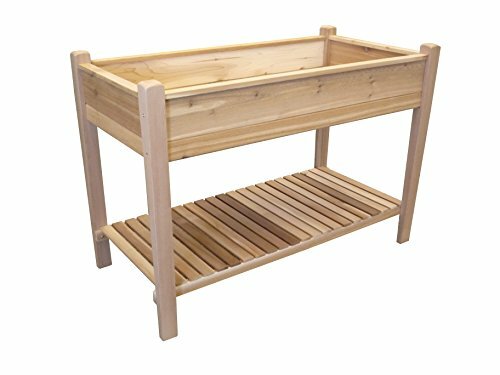 Extend your growing season, produce higher yields, and control pests and weeds with this beautiful American Red Cedar Raised Bed from Tierra Garden. Extend your growing season, produce higher yields, and control pests and weeds with this beautiful American Red Cedar Raised Bed from Tierra Garden. Cedar is naturally rot and insect-resistant. Raised height eliminates stooping or bending making it a great pick for those with back problems. Also perfect for seniors. The natural wood provides an appealing addition to any gardening area. Can be set up almost anywhere! Ideal for decks, balconies, or patio gardening. Easy to assemble and made in the USA. Holds 3.5 cubic feet of soil. Tierra Garden is an importer, designer and manufacturer of distinctive garden products that has developed a reputation for quality products and a broad selection of unique garden hard goods.